There will be two Kingdom Hearts titles announced this year, and one of them will be making its debut appearance at next week's E3 - but neither of them will be Kingdom Hearts III. In the latest issue of Game Informer, there's an interview with Square-Enix's High Summoner of Strange Fashion, Tetsuya Nomura, about the upcoming Western release of his Kingdom Hearts: Birth By Sleep for the PSP. While Birth By Sleep is the main crux of the piece, Nomura also elaborated on his upcoming projects, like the long-dormant Final Fantasy Versus XIII (which may or may not be at E3) and the future of the Kingdom Hearts series. Regarding the existence of Kingdom Hearts III, Nomura denied ever confirming to Ultimania that the title was in development. However, not all is lost, Kingdom Hearts fans: According to Nomura, there are two new Kingdom Hearts games "other than III" that will be revealed this year. Nomura confirmed to GI that one of the new titles would be announced at next week's E3. It's possible that the new reveal will be Kingdom Hearts: Recoded, which was accidentally "announced" by actor Phil Snyder, set to voice Jiminy Cricket. However, given that Recoded is probably, by the sounds of it, a remake of Japan-only mobile game Kingdom Hearts: Coded ... that wouldn't be a very exciting E3 announcement, would it? 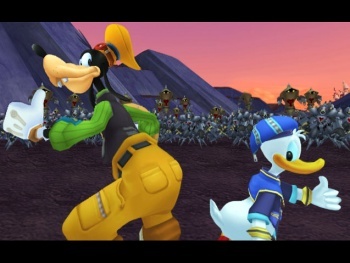 Nomura said the project that would be making its debut at E3 was born out of a desire to "do something for the North American fans," which means that announcing a remake of a cell phone game would be hugely underwhelming. As for Versus XIII? Development is still proceeding smoothly "one step at a time," said Nomura, and that he "plans to showcase the title at a certain point." Next week would be a pretty damn convenient certain point, Nomura-san. Just saying.